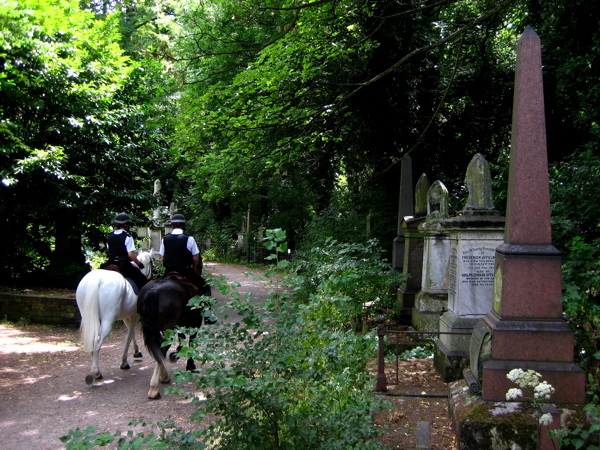 At least once each Summer, I direct my steps eastwards from Spitalfields along the Mile End Rd towards Bow Cemetery, one of the “Magnificent Seven” created by act of Parliament in 1832 as the growing population of London overcrowded the small parish churchyards. 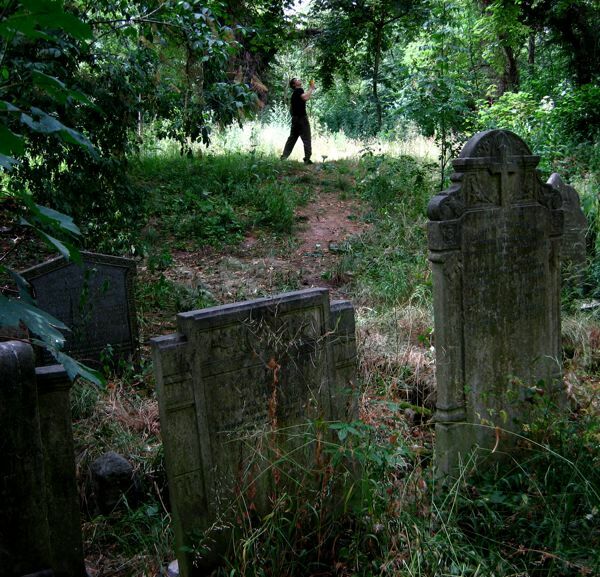 Extending to twenty-seven acres and planned on an industrial scale, “The City of London and Tower Hamlets Cemetery” as it was formally called, opened in 1841 and within the first half century alone around a quarter of a million were buried here. Although it is the tombstones and monuments that present a striking display today, most of the occupants of this cemetery were residents of the East End whose families could not afford a funeral or a plot. They were buried in mass public graves containing as many as forty bodies of random souls interred together for eternity. 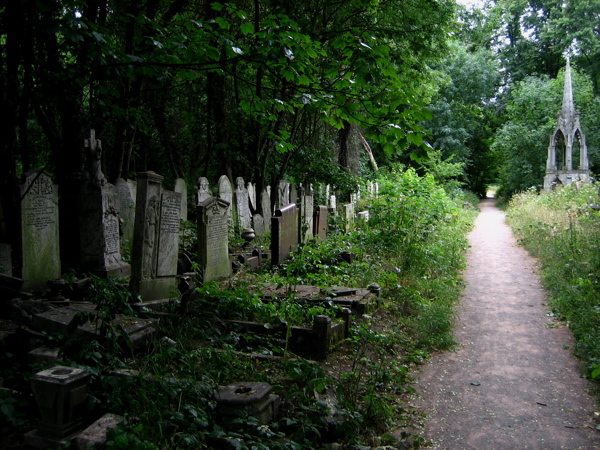 By the end of the nineteenth century the site was already overgrown, though burials continued until it was closed in 1966. Where death once held dominion, nature has reclaimed the territory and a magnificent broadleaf forest has grown, bringing luxuriant growth that is alive with wildlife. 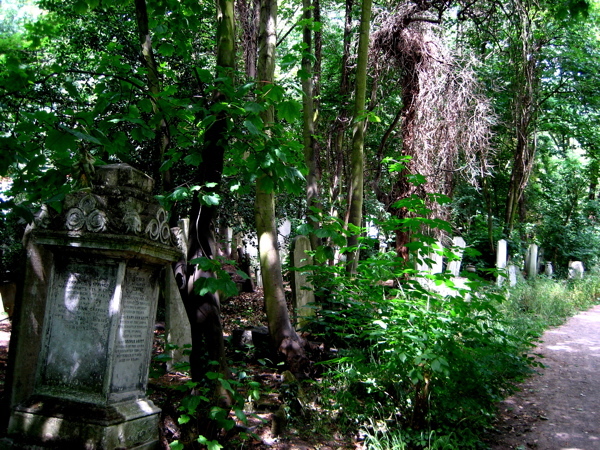 Now the tombstones and monuments stand among leaf mould in deep woods, garlanded with ivy and surrounded by wildflowers. 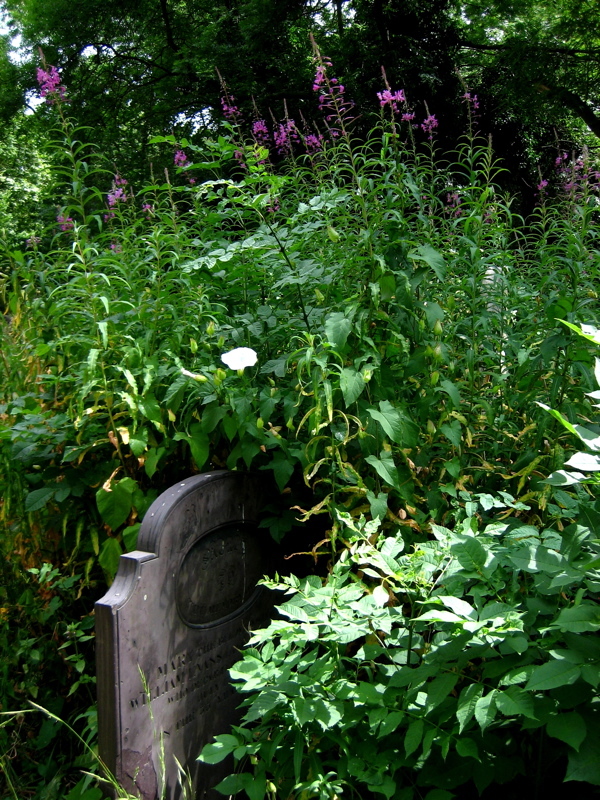 Tombstones and undergrowth make one of the most lyrical contrasts I can think of – there is a beautiful aesthetic manifest in the grim austerity of the stones ameliorated by vigorous plant life. But more than this, to see the symbols of death physically overwhelmed by extravagant new growth touches the human spirit. It is both humbling and uplifting at the same time. It is the triumph of life. Nature has returned and brought more than sixteen species of butterflies with her. This is the emotive spectacle that leads me here, turning right at Mile End tube station and hurrying down Southern Grove, increasing my pace with rising expectation, until I walk through the cemetery gates and I am transported into the green world that awaits. At once, I turn right into Sanctuary Wood, stepping off the track to walk into a tall stand of ivy-clad sycamores, upon a carpet of leaves that is shaded by the forest canopy more than twenty metres overhead and illuminated by narrow shafts of sunlight descending. It is sublime. Come here to see the bluebells in Spring or the foxgloves in Summer. Come at any time of the year to find yourself in another landscape. Just like the forest in Richard Jefferies’ novel “After London,” the trees have regrown to remind us what this land was once like, long ago before our predecessors ever came here. 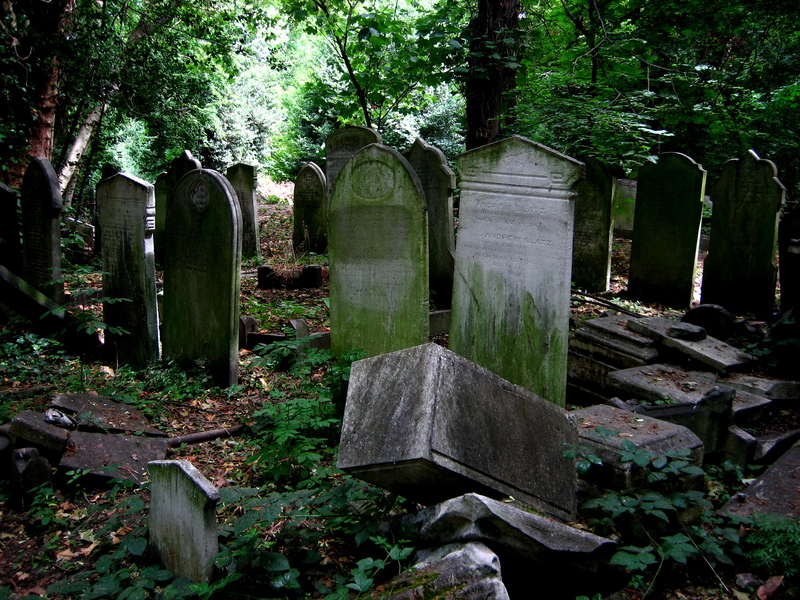 Over time, the tombstones have weathered and worn, and some have turned green, entirely harmonious with their overgrown environment, as if they sprouted and grew like toadstools. The natural stillness of the forest possesses greater resonance between cemetery walls and the deep green shadows of the woodland seem deeper too. There was almost no-one alive to be seen on the morning of my visit, apart from two police officers on horseback passing through, keeping the peace that is as deep as the grave. Just as time mediates grief and grants us perspective, nature also encompasses the dead, enfolding them all, as it has done here in a green forest. These are the people who made East London, who laid the roads, built the houses and created the foundations of the city we inhabit. The countless thousands who were here before us, walking the streets we know, attending the same schools, even living in some of the same houses we live in today. The majority of those people are here now in Bow Cemetery. As you walk around, names catch your eye, Cornelius aged just two years, or Eliza or Louise or Emma, or Caleb who enjoyed a happy life, all over a hundred years ago. None ever dreamed a forest would grow over their head, where people would come to walk one day to discover their stones in a woodland glade. 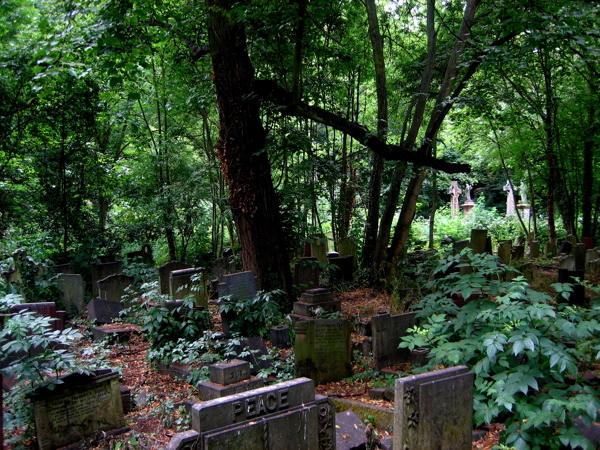 It is a vision of paradise above, fulfilled within the confines of the cemetery itself. As I made my progress through the forest of tombstones, I heard a mysterious noise, a click-clack echoing through the trees. Then I came upon a clearing at the very heart of the cemetery and discovered the origin of the sound. It was a solitary juggler practicing his art among the graves, in a patch of sunlight. There is no purpose to juggling than that of delight, the attunement of human reflexes to create a joyful effect. 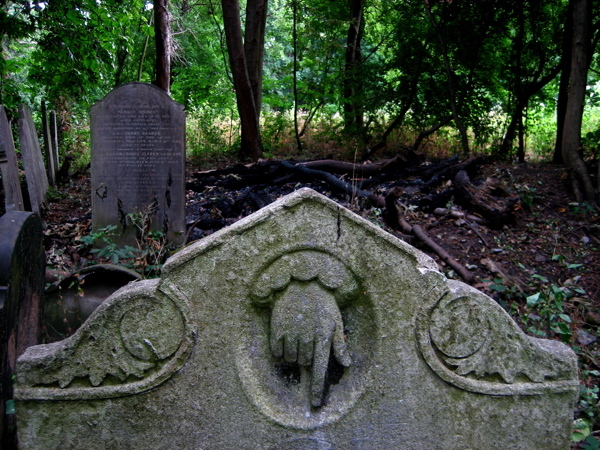 It was a startling image to discover, and seeing it here in the deep woods – where so many fellow Londoners are buried – made my heart leap. Outside on the streets, a million people were going about their business while in the vast wooded cemetery there was just me, the numberless dead and the juggler. Another very moving post. I marvel at how you do manage to choose truly unique subjects for these post. The very living and those who merit the attention of the very living. This, gentle author, is an awesome post. Thank you! 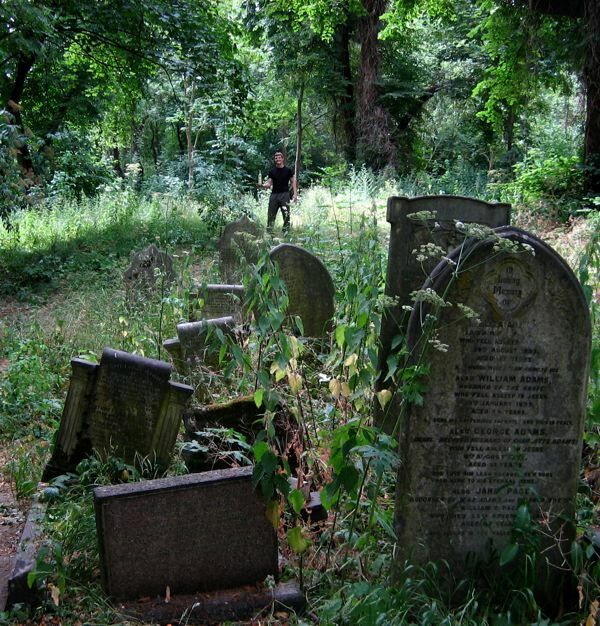 * run by the The Friends of Tower Hamlets Cemetery Park – who were set up in 1990 to help preserve the Cemetary and the heritage and green space that it represents. 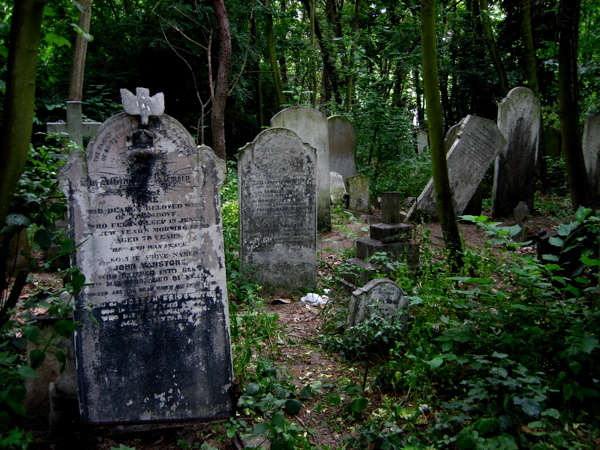 Tower Hamlets Cemetery Park is owned by the London Borough of Tower Hamlets (LBTH). The ‘Friends’ manage the Cemetery Park via a Service Level Agreement with LBTH Parks. Long may this arrangement continue. What we can now enjoy is very largely down to the efforts of the Friends who have dedicated themselves to this very important green space in Tower Hamlets. As old and established as London appears to be, we are reminded that nothing is forever.The cycle of life continues to roll on and that can be a very beautiful thing. It’s all about rebirth and renewall. There is a life-lesson to be learned from that. I came across your blog recently whilst doing research on my ancestors who dwelt for many generations in Spitalfields and close-by environs. I’m driven by a desire to know these people–not as a collection of random names and dates on a paper–but to know how they lived, worked and had their being. While I realize that time and way of life is long gone, the container of the place that held them remains, and so must their essence have infused it deeply. From where I sit, many thousands of miles distant across the pond, there is a delicious sense of being able to glimpse through a magical lens into the world of Spitalfields through your blog. It’s magical because I can never predict what will swim into view through that lens: an ancient Synagogue, the shockingly blue face of a cornflower, or a flotilla of grave stones bobbing on an emerald sea. No matter the subject, you treat it with such reverence and care that each post is like having a treasure quietly revealed–the perfect blend of sacredness and lusciousness! What an atmospheric place. 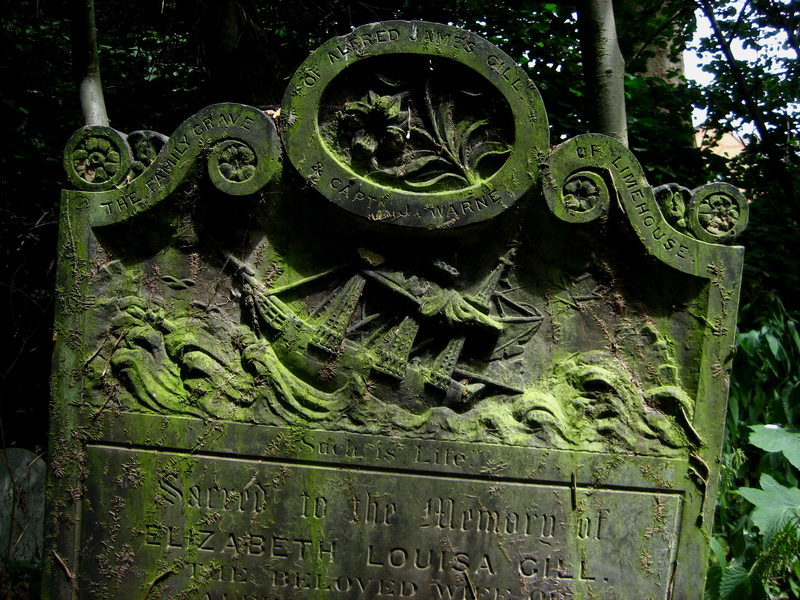 I’m loath to say that i love graveyards but i do and was in one in Manchester only last week . I have recent relatives buried here (and probably a whole load of not so recent relatives). My Jones’s were buried here between 1929 and 1939. Poor Ethel died of TB aged just 19. 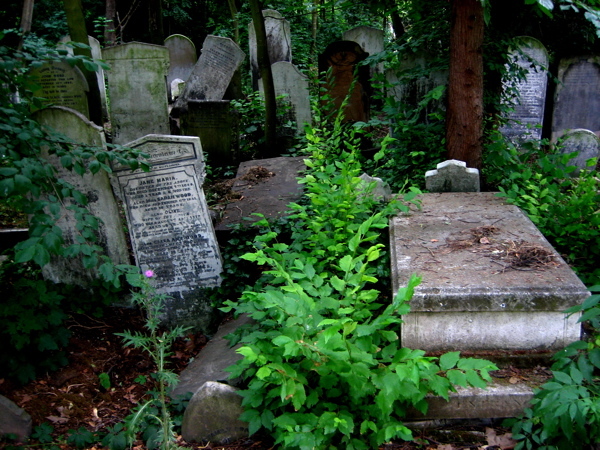 Until 2001 we lived in Eric Street Mile End, a short walk from the cemetary. I used to take my son for a walk in his pram there. It was very peaceful. Now, doing my family history, I wish I’d looked more closely at the names on the gravestones. I am English and grew up in Bethnal Green but now live in Melbourne, Australia. I visited the ‘Boneyard’ (as it was affectionately known), a few years ago when visiting my brother and his family who lived in Eric St, Bow, just across the road. It was strangely beautiful and I’ve never forgotten it but your post brought it vividly back to life. Thank you. After all these years my heart is still in England and her wonderful history. You can take the cockney out of London, but you can’t take London out of the cockney. Thanks for the memories and please keep up the good work. i used to live near the mount zion slave cemetery in washington d.c. where thousands of people who built the city were buried. the snowdrops reminded me of this. My Great Grandfather is buried here, it is a lovely and peaceful place. However major renovation seems to be occuring – large areas being cleared, including whole tree chopping. Some parts have lost their magical charm. Obviously nature will fight back but the devastation seems very drastic. Is this part of ‘The Friends’ plans? what wonderful pictures and insightful commentary. Old Church yards are such havens of peace -and I remember hearing birdsong in them when I used to visit some of them when at school.I am now living in a countryside spot, but those London Church yard birds of long ago(I am 75) still remain in my head! I lived in Boise, Idaho for about a year during the first Gulf War. To try to come to grips with war, even a war I experienced solely through a tiny black and white television set, I often walked in the Morris Hill cemetary, looking at the gravestones – from the recent ceremonial graves of veterans, to the haunting stones of infants, to some marked only with a single name and a date of death. He told me that he was one of three surviving children, out of eleven, and that he and his siblings were all still alive. He said that the four year old died of eating apples sprayed with arsenic to keep off insects; the 18 month old drowned in a ditch, and the infants just died. He told me his family once owned a huge orchard (for which Orchard street is named), but that over the years the trees had all been cut down but one, and that he still lived in the original family home, which was at the time an old 2-story white farmhouse, out of place among its more modern neighbors. Before I moved away, I saw an ambulance in front of the old Archer home, and I wonder if he joined his family at rest. If you ever go to Boise, find them there. He entrusted me with his story. I would hate to see it lost. My relatives came from Spitalfields – Harper and Walker : and from Bow/Bromley – Hunt, Sharman and Waldon. Anybody with any connection to these names? We moved to Forest Gate/East Ham (now unfortunately known as “Newham”) in the fifties. I am studying my family history and am looking for William Cook interred Bow Cemetary in 1870. Can any one point me in the right direction to see if there is an index of gravestones please? Melanie, you can find it at the Metropolitan archives I think. Also Bancroft road E1. There is archive centre. Visited the UK from Australia to find family Helmcken. My 5 X great grandmother, Catherine Helmcken, was buried 11 Feb 1869 in this cemetery but sadly no headstone was found. The picture you painted was beautiful of this cemetery and gave me a lovely image to recall. My grandmother is buried at Bow cemetery, her maiden name was Frances Coker, I would love to find the grave as she died before I was born in 1941. I was told don’t go alone as it’s quite a dodgy place and you could get mugged. A wonderful, lyrical and deeply moving post – and excellently written too. Hello, I have a cousin buried in Bow Cemetery, his name was Joseph Shepherd Guy. He was buried on 2nd Nov 1871 aged 25, he died of small pox. If anyone out there knows where he is buried please let me know? it looks a very interesting place but I cannot visit.